I love to explore new tastes in the kitchen, but I also have equal love for my favorite comfort foods. Isn’t it amazing how comfort foods instantly remind you of home? Just one bite and I feel like a kid again in my mama’s kitchen! 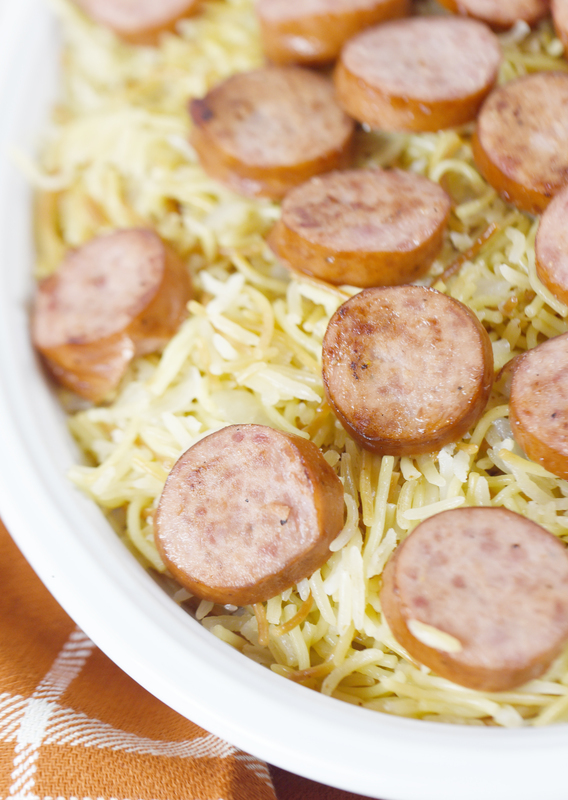 Smoked Turkey Sausage and Vermicelli Rice Pilaf is one of my favorite comfort foods. My mom made this dish almost every week when I was growing up and now I love to make it for my kids too. One nice thing about this dish is that you can change it up pretty easily to suit your own tastes. One of my favorite things about it is the browned-buttery taste of the vermicelli noodle & rice mixture. It gives the pilaf such a complex flavor. I added onions to the mix this time, but most veggies would work well with this. 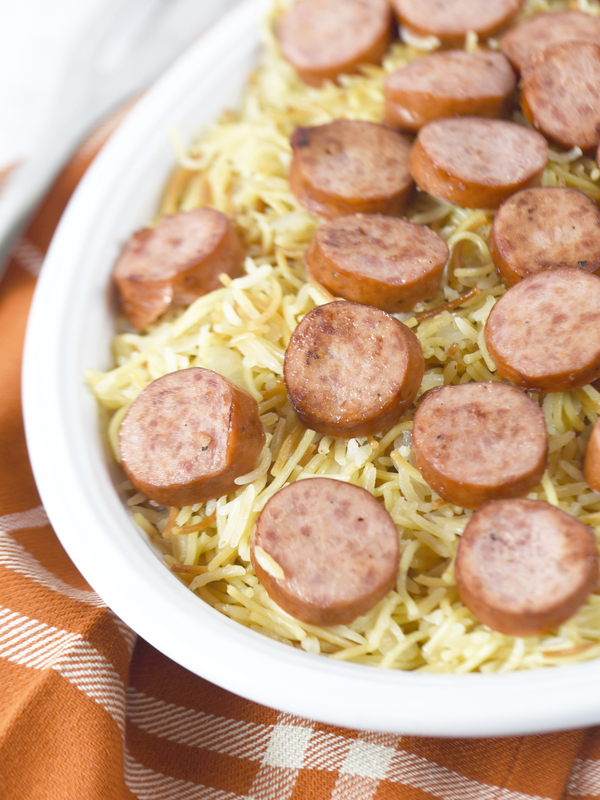 I used Hillshire Farm® Smoked Turkey Rope Sausage and the flavor is amazing! This truly is the sausage I remember growing up. 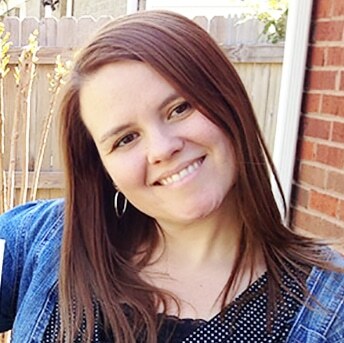 I found the Hillshire Farm® Turkey Sausage at Target with all the other refrigerated meats. 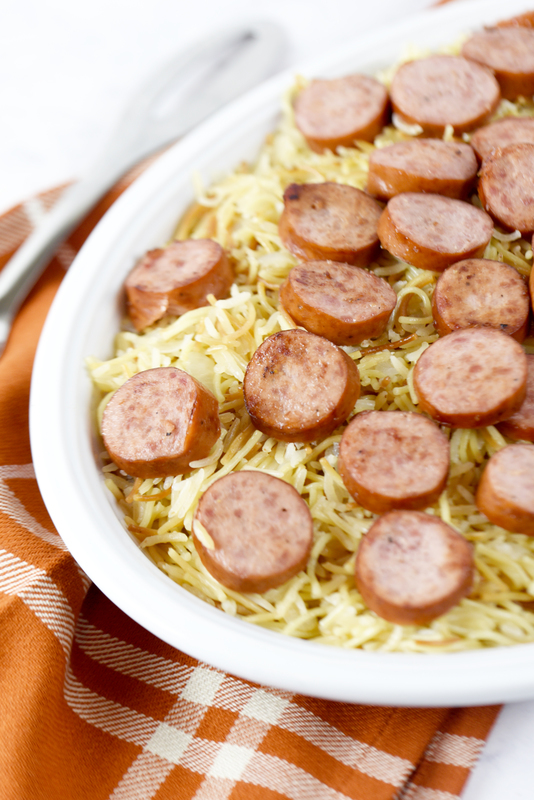 They had many other varieties of Hillshire Farm® sausages to choose from that would also taste great in this dish. Be sure to check out this CARTWHEEL OFFER FOR 20% OFF HILLSHIRE FARM® SAUSAGES before your next shopping trip to Target! Melt butter on medium heat in a large skillet. Add rice and noodles. Cook until the noodles are a deep golden color. Add onions and chicken broth to the skillet and turn up heat to medium-high. Bring mixture to a boil while stirring then turn the heat down to a simmer and cover for 15 minutes or until the mixture is soft and fluffy. Meanwhile heat up another large skillet and brown the meat according to the package (making sure to cook thoroughly). Once the rice mixture is ready you can either mix in the sausage or serve them separately. This is a meal we will go back to often! 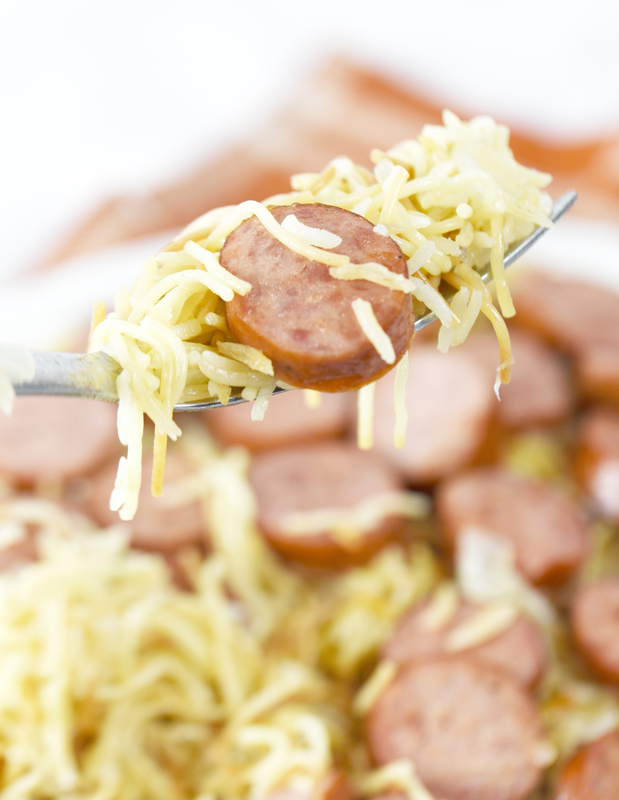 Do you have any comfort foods using sausage?